We are happy to announce that LIXIL Africa is now a member of Proudly South African. 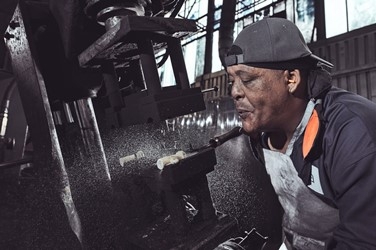 This partnership is important as our brands such as Cobra and Vaal contribute to South Africa’s economic growth and job development, both of which are aligned with the Proudly SA objective; to help in the creation of 5million new jobs by 2020. Both Cobra and Vaal have a very strong heritage in South Africa and Africa. Cobra was established in 1951, opening a factory in Krugersdorp that manufactured taps and plumbing fittings for the local market, which has grown to become a leader in water technology and recently expanding its portfolio to include acrylic baths, offering the consumer a full range of Cobra products they can trust. Our products aren't merely manufactured, but rather carefully hand crafted by our qualified artisans to leave a lasting impression. This is true craftsmanship and at Cobra, our people are continually coached and up-skilled where possible to ensure they adhere to our quality principles while growing and developing their careers and skills base. Vaal Sanitaryware has been producing sanitaryware since 1946, and is the most widely recognisable of all the ceramic sanitaryware products on the South Africa market, all produced at the Vaal factory in Meyerton. For over 70 years Vaal Sanitaryware has constantly evolved to deliver on quality, human-centric design, reliability and affordable products for the South African market. Promotion of locally manufactured goods is critical to South Africa’s growth and job creation. People like to buy a product with a story; a product that they know was made by hand and with attention to the smallest of details and that is exactly what we at Cobra and Vaal deliver on daily. “As a manufacturer we know how important job creation is in our country,” says Andrew Camphausen, Public Affairs Officer, LIXIL Africa. “For every 1 person that we employ, 5 – 8 people are directly empowered, we therefore really need South Africans to buy local products and not imported goods. This will lead to higher local demand, which leads to higher production which leads to lower prices.” Camphausen concludes. Choose Proudly South African, choose Cobra and Vaal.